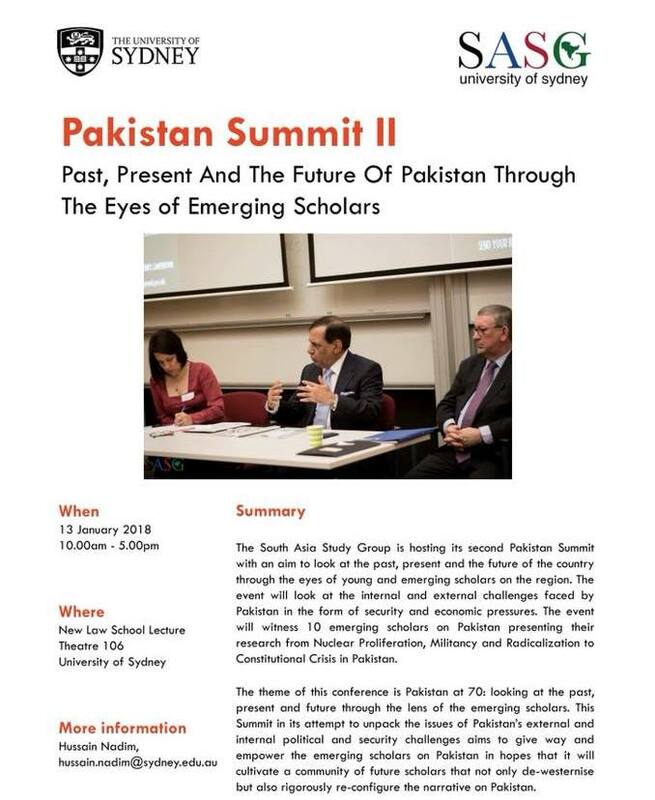 We would like to invite you to the South Asia Study Group’s Second Pakistan Summit on Saturday, 13 January 2018 from 10.00am - 5.00pm at New Law School Lecture Theatre 106 University of Sydney. The theme of this years summit is 'Pakistan at 70: Looking at the Past, Present and Future through the lens of the Emerging Scholars'. The event will look at the internal and external challenges faced by Pakistan in the form of security and economic pressures. The event will witness 10 emerging scholars on Pakistan presenting their research from Nuclear Proliferation, Militancy and Radicalization to Constitutional Crisis in Pakistan. 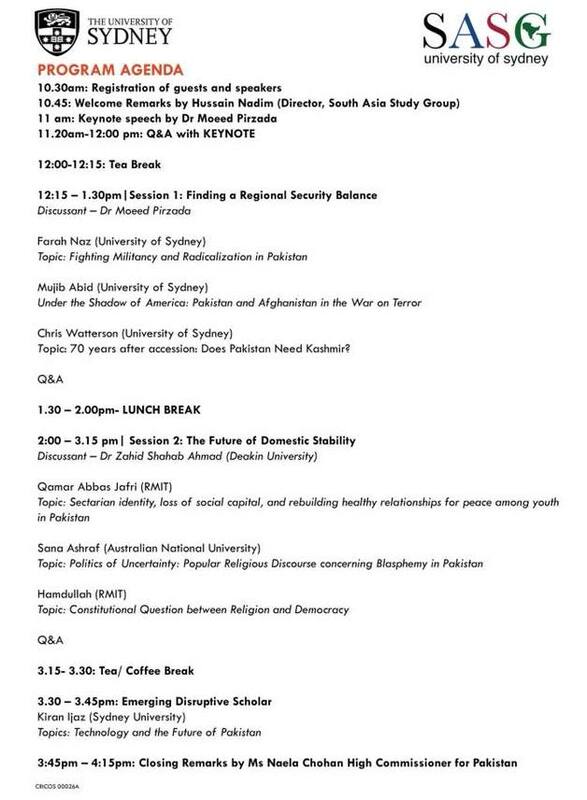 The Summit, in its attempt to unpack the issues of Pakistan’s external and internal political and security challenges aims to give way and empower the emerging scholars on Pakistan in hopes that it will cultivate a community of future scholars that not only de-westernise but also rigorously re-configure the narrative on Pakistan. Dr. Moed Pirzada, a leading talk show host and political analyst in Pakistan will deliver the keynote address. The title of Pirzada’s talk will be ‘Pakistan after Panama Verdict: The Challenges and Opportunities’. Mr Pirzada is a Pakistani political commentator, geostrategic analyst and a television news journalist. He is an anchor at Dunya News and hosts TV programs. He has interviewed many politicians around the world and written columns for national newspapers.